The Washington Post reported Tuesday that the Pentagon has deployed more than 5,000 soldiers in Iraq, some 20 percent more than the current “cap” of 3,870 troops publicly announced by the Obama White House. The Daily Beast web site gave the total as 5,325. The revelations of additional US forces came after ISIS attacked a Marine Corps position in Makhmour, about 70 miles south of Mosul, Iraq’s second-largest city and the largest urban area controlled by ISIS in either Syria or Iraq. ISIS mortars slammed into the base, dubbed Firebase Bell, killing Staff Sergeant Louis Cardin and wounding several more Marines. Some of the wounded had to be evacuated out of the country in order to receive proper treatment. Cardin, 27, from Temecula, California, was on his fifth deployment in a war zone. He had served three tours of duty in Afghanistan and one previous tour in Iraq before he was airlifted into Makhmour last month as part of the deployment of the US Marines 26th Expeditionary Unit from the USS Kearsarge, a troop carrier stationed in the Persian Gulf. On Monday, a small ISIS unit attacked the base, home to 200 Marines, with small arms fire. They were driven off without casualties. 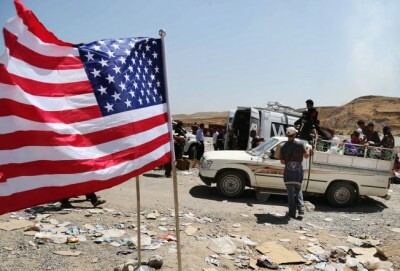 At that point, Pentagon spokesmen acknowledged the existence of Firebase Bell, the first US-only facility to be set up in Iraq since the formal end of the US military occupation of the country in December 2011. The Marine base sits adjacent to Iraqi Army and Kurdish Peshmerga positions in the area where the Iraqi government is assembling forces for a planned offensive against Mosul, expected later this year. The 200 soldiers at Firebase Bell operate 155mm artillery to provide long-range support for Iraqi Army and Kurdish troops and US Special Forces. The Obama administration has classified the deployment of the Marines and many other soldiers as “temporary” in order to claim that the number of troops in Iraq is below the current ceiling of 3,870 that it reports to Congress. The purpose of the official secrecy and lying is not military security. ISIS was well aware of the existence of the firebase, which it targeted with mortar shells. In any case, as one official admitted, it is hard to hide 200 heavily armed Marines stationed only 10 miles from enemy lines. The purpose was to conceal from the Iraqi and American people what the US government and Pentagon are doing in Iraq. President Obama has repeatedly declared that he brought an end to combat in Iraq and that he would not send US combat forces back to that country. But this is what, in fact, is happening. Other press reports noted that the US government had previously claimed that ISIS used mustard gas against Kurdish troops stationed in Makhmour last year. Establishing a base for the US Marines on the same site makes nonsense of the pretense that US forces are not playing a ground combat role in the war against ISIS. The exposure of previously secret US military facilities in northern Iraq follows reports earlier this month that the Pentagon was operating two secret airstrips in northern Syria, inside the region along the Syrian-Turkish border controlled by the Syrian Kurdish PYG. One airstrip, at Rmeilan, in the far northeastern corner of Syria near the Iraq border, was doubled in length in order to accommodate US cargo planes bringing supplies for the PYG and US Special Forces troops working with them. The other airstrip, near Kobani, was reported March 6 to be under construction.